Looking for a pair of sunglasses for those early morning or late evening rides when it’s still dark? In the past, the clear or yellow lens used to be a popular choice for winter riding. So does the photochromics. But these days, there’s a new kid on the black called Oakley Prizm Low Light lens. In short, it’s a Oakley Prizm + clear lens. You’ll get the best of both world. How Does Oakley Prizm Lens work? What is Oakley Prizm Low Light Lens? 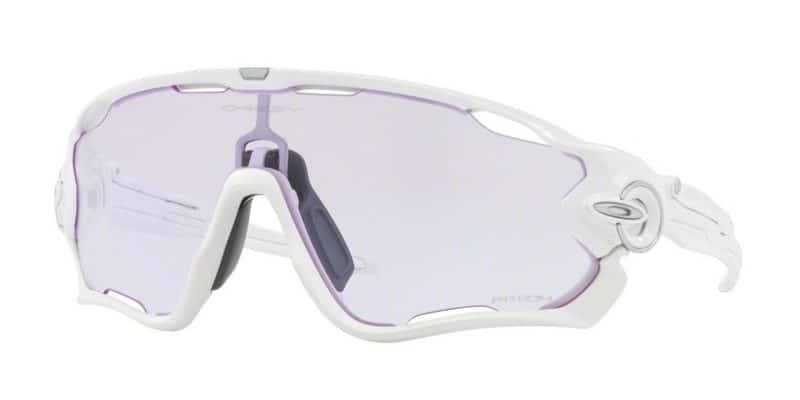 Unlike the Oakley Prizm Road sunglasses, the Prizm Low Light lens is only available in 5 Oakley frames and only in white (at least for now). 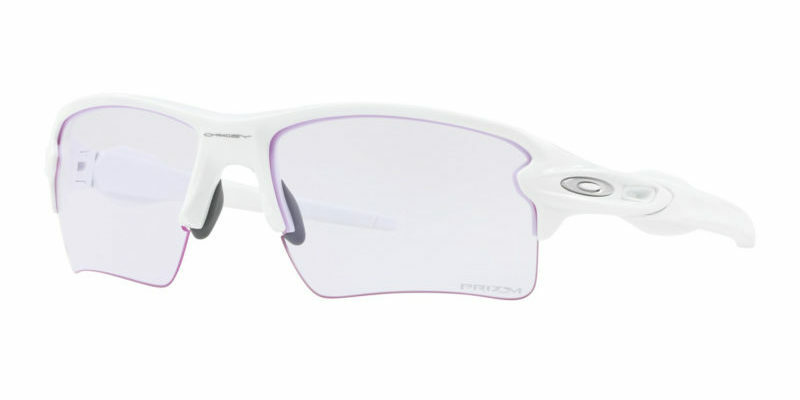 The Jawbreaker is the replacement for the popular Oakley Jawbones. Oakley worked with World Champion, Mark Cavendish to design a frame that provides the cyclist with an expanded field of view, 44% much more than a standard dual lens sunglasses. The lens is user changeable in a matter of seconds and the stem can be adjusted to 3 different lengths to suit your liking. The Flight Jacket is Oakley’s latest addition to its cycling sunglasses lineup. The top part of the frame is removed to provide an unobstructed view in what is now called a brow-less design. Due to its frame design, it’s more suitable for someone with a medium to large face. The EVZero is Oakley’s lightest performance sunglasses. It’s actually a redesign of the Oakley Subzero which was released in the 90’s. To achieve its super light status, Oakley has completely removed the frame, giving you an unobstructed view, a problem many of us has faced. Together with the EVZero, the Flak 2.0XL is among Oakley’s lightest cycling sunglasses. It’s an upgrade of the previous Flak Jacket models. Retaining its 2-piece lens design, Oakley has enlarged the lens in this model to achieve a large field of view. The Oakley Prizm is a lens technology developed in the late 90’s and made available in 2014 after 15 years of R&D and engineering work behind the scenes. 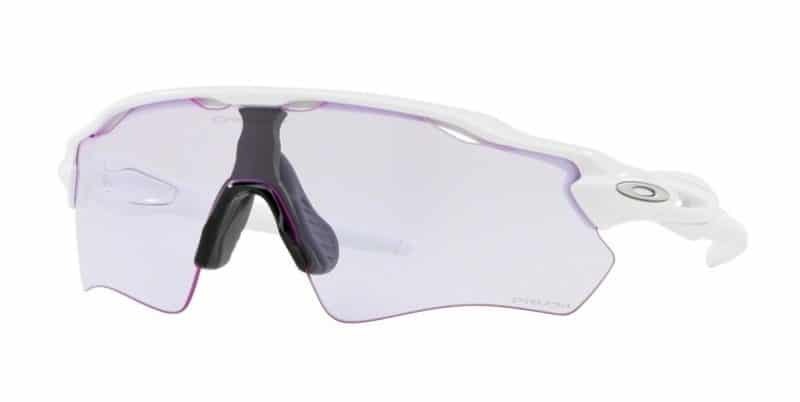 Since then, Oakley’s Prizm lenses have been slowly replacing most of their traditional lenses and today they’re available in many sports specific variations, including cycling. 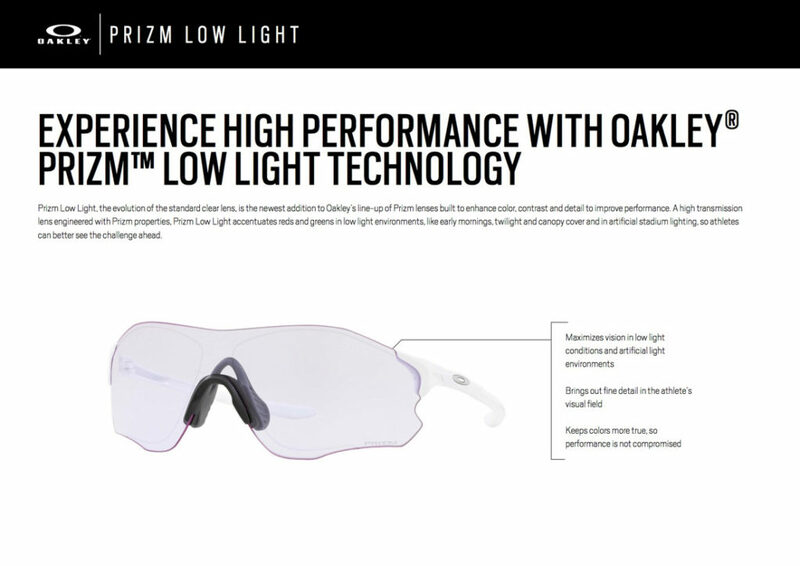 Here’s what Oakley says about its Prizm technology. Of course, there are a few more similar quotes from Oakley regarding the Prizm, but they pretty much say the same thing but in a slightly different language. It’s all down to light wave engineering. A small section of the electromagnetic spectrum is visible to our naked eyes in what we generally call light. Our eyes respond to light waves between 390nm to 790nm; from violet to red. With clever light wave engineering, Oakley is able to alter the transparency and opacity of specific wavelengths to enhance certain colors and downplay the others. This results in the distracting colors being filtered out and increased contrast. Special dyes are then used to tint the polycarbonates in which the lens are made of to achieve the desired effects. To bring this application a step further, Oakley have made sports specific Prizm lenses to help the athlete pick up on nuances that could otherwise be missed by the naked eyes. The Prizm Low Light lens were first made available in February 2018. It has a slight transparent pink tint with a visible light transmission (VLT) rating of 75%, which is a measurement of how much light are passed through the lens. The higher the rating, the more light that passes through. For comparison, a clear lens has a VLT of 93% while the photochromic lens range between 23 to 69% depending on the UV exposure levels. But these 2 lenses lack the Prizm qualities that enhances the contrast while riding in low light conditions. The Prizm Low Light lens accentuates the red and green colors in low light conditions to enhance colors and contrasts in low light and artificial lighting conditions. Unlike other low light lenses which generally come in either brown, orange or yellow tints, the Oakley Low Light maintains the true colors so that they don’t affect the wearer’s color recognition. 1. Are the other Oakley Prizm lenses suitable for cycling? 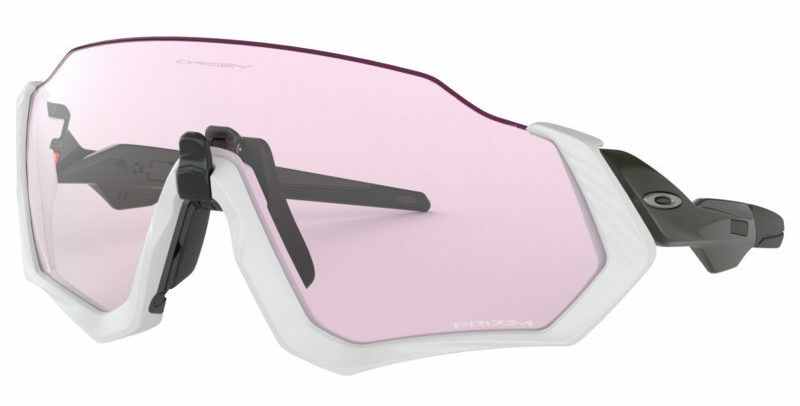 As the Prizm lenses see more usage, Oakley has expanded its lineup and now they cover a range of sports from cycling to skiing and fishing with different variants of the Prizm lens. Prizm Road. The Prizm Road lens is aimed towards road cyclists riding under sunny and clear conditions. It enhances the yellow, green and red colors for the cyclists to be able to clearly spot road hazards and changes in the road texture from afar. Prizm Trail. As the name implies, the Prizm Trail is aimed for mountain biking in the trails with difficult and changing lighting conditions. The brows and reds are enhanced, while green is brightened. Prizm Daily. The Prizm Daily enhances all colors in the visible light spectrum to create an enhanced visual with vibrant colors. It’s suited for everyday use. 2. What is the difference between the Oakley Prizm Low Light, Clear and Photochromic lens? There are two main difference between these lenses. Firstly, the Prizm Low Light has a Visible Light Transmission (VLT) of 75%, while the Clear lens is at 93%. The Photochromic ranges between 23% at full UV exposure and 69% at zero UV exposure. 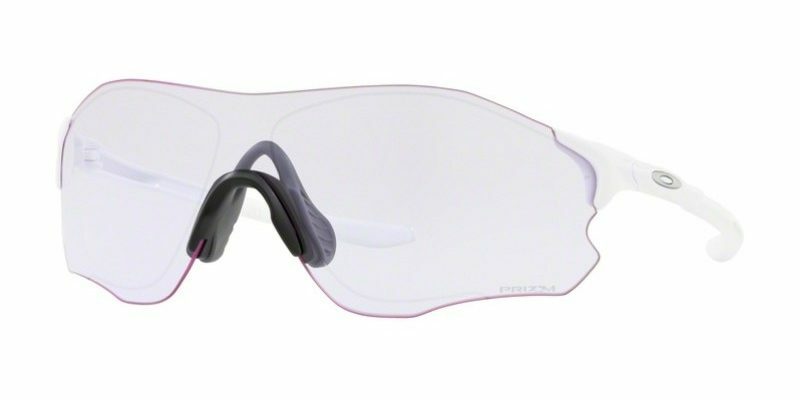 Secondly, the Prizm Low Light lens utilizes Oakley’s Prizm lens technology which enhances the overall visual, while the Clear and Photochromic lens does not. Among these 3, the Photochromic lens is the most versatile as it can be used across a wide range of lighting conditions. 3. What is the difference between Oakley's Prizm and Polarized lenses? Prizm and Polarized are 2 completely different things. Polarized lenses are basically filters in sunglasses that block reflected light such as those from a wet road or a car’s hood, hence reducing glare. Today, almost all lenses can be made available into a polarized version, regardless the color of its base tint. Prizm, on the other hand is a marketing term for Oakley’s lens technology that enhances contrast. Traditional sunglasses use a blanket filter for all colors. The Prizm is able to control the colors by fine-tuning its individual wavelengths to suit a specific usage such as cycling, skiing or fishing. 4. Will Oakley make the Prizm low light lens available separately or with other frames? There is a very high chance they would. Initially, the Prizm Low Light lens were made available with 4 frames (Jawbreaker, Radar EV, EV Zero and Flak 2.0 XL). Recently Oakley has added the Flight Jacket to its lineup and there will be more to follow soon. 5. Is the Oakley Prizm Low Light Lens polarized? No, they’re not. There are lenses that are both polarized and Prizm such as the Oakley Daily Prizm.